We’d love your help. Let us know what’s wrong with this preview of The Harlem Charade by Natasha Anastasia Tarpley. When these three strangers join WATCHER. SHADOW. FUGITIVE. neighborhood will ever be the same . . .
To ask other readers questions about The Harlem Charade, please sign up. where can i find the quiz? So. I feel as if the previous reviews have sincerely underestimated how wonderful, how significant this book is. The Harlem Charade is a mystery featuring three POC teens who rail when their neighborhood might be bulldozed to make way for an amusement park. The story also incorporates the history of 1960s Harlem artists fighting for inclusion in the mainstream art world. Natasha Tarpley's writing is so deftly done, relating the significance of our past affecting our futur Loved it. Review to come. Fun mystery where the reader is constantly picking up new clues and having to figure out how they fit together. Also a story of unlikely friendships. Fun middle grade art mystery filled with lots of interesting facts about Harlem. Jin, Alex and Elvin want to save their historic neighborhood from being turned into an amusement park tourist trap. I really enjoyed this. Great characters, a great setting. Bluebonnet Book Reading 18-19. This was a great mystery book for kids. It has such great messages about not judging books by their covers, digging deeper, among other things.. this was a great read! Combined art history and Harlem history with a mystery that was edgier than I expected for a MG novel. The message was a bit obvious but I'm not 10-12 years old. It might not be obvious to a middle grader. Didn't finish this. Several chapters in there started to be abrupt changes in narrative point of view, and I didn't think the main character used age-appropriate language. Disappointing, as I was looking forward to another art-centered mystery. My absolute favorite types of stories are the ones about place. I adore novels in which the setting is so lively, so carefully and tenderly described that the place itself is one of the novel's central characters. This is a difficult thing to do, but when it is done well, it elevates a perfectly fine book to a great one. 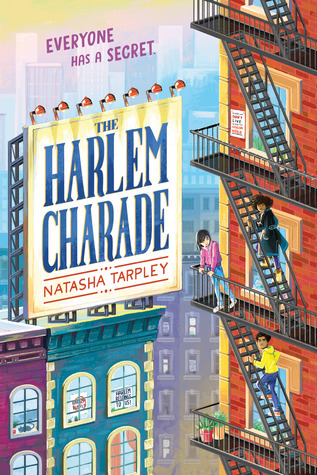 Natasha Tarpley's 'The Harlem Charade' is just that sort of book. A young adult mystery novel set in what is arguably New York's most famous neighborhood, 'The Harlem Charade' f My absolute favorite types of stories are the ones about place. I adore novels in which the setting is so lively, so carefully and tenderly described that the place itself is one of the novel's central characters. This is a difficult thing to do, but when it is done well, it elevates a perfectly fine book to a great one. Natasha Tarpley's 'The Harlem Charade' is just that sort of book. A young adult mystery novel set in what is arguably New York's most famous neighborhood, 'The Harlem Charade' follows Elvin, Jin, and Alex as they attempt to unravel the story behind a vicious attack upon Elvin's grandfather and the discovery of rare painting in a community garden. The truth behind both mysteries are of course related, and Tarpley weaves an intricate tapestry that shows the connections between art, inequity and power differentials, community engagement, grassroots organizing, and ownership and belonging. Elvin and Jin (Elvin especially) were great characters. I had a harder time connecting with Alex and found it near impossible for me to do so. Readers have to suspend themselves in disbelief to imagine these three twelve-year-olds solving what is (in this fictive world) one of modern Harlem's greatest political scandals. Nonetheless, it was refreshing to read a novel in which young children learned about the injustice of racial and economic marginalization and were engaged in their community's political and economic well-being. However, without shear doubt, Harlem was the novel's greatest character. Like the real Harlem, it was a city in the midst of drastic racial, economic, and cultural transition. The insidious effects of gentrification--the disempowerment and displacement of longstanding (often working-class) communities of color--however, had yet to take root in this fictional universe. Unlike the real Harlem, the Harlem in Tarpley's novel has not drastically lost its families, bodegas, community centers, cultural practices, etc. It's on the cusp, and the heroic action of these three twelve-year-olds help stave off (this particular) socioeconomic/sociopolitical shift. The real Harlem has not been so easily protected. The novel does start to drag a bit by the second half, and there is a somewhat overly dramatic, unengaging climax in the penultimate chapters. The Harlem Charade is an interesting book. I think The Harlem Charade is unlike any other book I’ve read before. It provides a different type of action that everyone should put in a mystery book. I recommend this book for reader’s ages 10-12 because even though there is no death there is a lot of moments that would potentially scare younger readers. The Harlem Charade is about three teenagers: Alex and Jin, who go to the same school, and Elvin, who was homeless until he met them. Elvin’s grandfat The Harlem Charade is an interesting book. I think The Harlem Charade is unlike any other book I’ve read before. It provides a different type of action that everyone should put in a mystery book. I recommend this book for reader’s ages 10-12 because even though there is no death there is a lot of moments that would potentially scare younger readers. The Harlem Charade is about three teenagers: Alex and Jin, who go to the same school, and Elvin, who was homeless until he met them. Elvin’s grandfather, Jacob, was found unconscious in a community garden. At first, Alex, Elvin, and Jin try to find out who clubbed Jacob. Then, they find a letter from a member of the Invisible 7, a group of famous painters. They find out that Jacob was one of the Invisible 7, and they start a whole new adventure. Markum, the mayor of Harlem, proposes to create an amusement park/museum called Harlem World, but at the same time he plans to destroy homes and shops to build it. Alex, Elvin, and Jin must stop Markum and his crew. Markum knows of their attempts to stop him and tries to capture them. Alex, Jin, and Elvin must put their lives into the hands of their friends Rad and T.J. without knowing if they are good or bad. The leader of the Invisible 7, named Henriette Drummond, left her paintings behind when she mysteriously disappeared, which are the only things keeping Markum from taking making Harlem World. Watch this amazing mystery unfold right in front of your eyes as you try to solve the mystery with the characters, unlike most mystery novels. I give this book 5 stars because the plot is stranger than most books, creating a different layer of suspense to the novel. My favorite part in the book is when they solve the most difficult part of the puzzles while trying to escape from Markum’s crew, trying to get the paintings before Markum gets permission to open Harlem World. Jin's grandparents own a bodega in Harlem, and she likes to watch people from her out-of-the-way quiet nook and write her observations in a special notebook. Alex spends as much time as she can helping the needy in the neighborhood as she tries to hide the fact that her parents are ridiculously wealthy. Elvin was recently sent from California to New York to stay with the grandfather he didn't even know existed, and now his grandfather has been attacked and seriously injured, and Elvin is living on the streets to avoid Child Protective Services. These three very different kids team up in THE HARLEM CHARADE first for a history project, and then to solve the mystery of Elvin's grandfather's attack and the disappearance of paintings that are a part of Harlem's history. 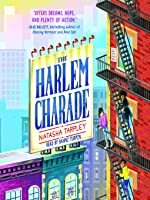 THE HARLEM CHARADE by Natasha Tarpley explores the rich history of the Harlem neighborhood, and it weaves an interesting mystery into that. Jin, Alex, and Elvin are great characters with intriguing backstories, and Halmoni, Jin's grandmother, is wonderful, too. I really enjoyed the emphasis on community and the importance of art and history. Tarpley did a nice job tying those themes to the book's plot, and the pacing is such that my interest was held page after page. A treasure hunt through the history of Harlem, this book is exciting and motivating. What a fantastic book! I loved it from the first page! I recently spoke to a friend who said, “I wish there were more books like this about different cities!” You learn the history of Harlem without feeling like it’s a history lesson, but an adventure. SUMMARY: Jin, Elvin and Alex find themselves unraveling the secrets of the Invisible 7! Along the way the discover art and history, foil a plot to turn Harlem into an amusement park, and save the legacy of an entire generation of artists. Violence: mild-- the villains threaten to kill the kids and at one point tie them up and try to set the building on fire. One of them also threatens them with a gun. THE BOTTOM LINE: I adored this book and I am so thrilled it is on the Texas Bluebonnet list next year. It will also be in our Quest for the Crown for 2019. STATUS IN MY LIBRARY: We have 2 copies in the elementary and will definitely have it in the middle school as well. Although this title suffers from a few plotting issues, it's an interesting mystery and an even more interesting look at an important neighborhood and time. This also speaks to the power and importance of art. Jin has to do a school project on her neighborhood, and she's stumped. Several ideas appeal to her and then she comes across Alex, a mysterious girl who hands out free Metrocards and collects donations for a food pantry. Maybe they could do something about that? Adding Elvin (who's homeless Although this title suffers from a few plotting issues, it's an interesting mystery and an even more interesting look at an important neighborhood and time. This also speaks to the power and importance of art. Jin has to do a school project on her neighborhood, and she's stumped. Several ideas appeal to her and then she comes across Alex, a mysterious girl who hands out free Metrocards and collects donations for a food pantry. Maybe they could do something about that? Adding Elvin (who's homeless since his grandfather was attacked in the park where a painting by a Harlem Renaissance artist was found) cements their goal: solving the mystery of the attack and the paintings becomes their project and mission. Along the way, they save the neighborhood form unscrupulous developers. And become friends. In the Harlem Charade, EVERYONE has a secret. This story focuses on three kids in Harlem who team up to solve a mystery AND try to defeat a nefarious politician who’s planning on some very weird gentrification. Jin is Korean American and works after school at her family’s bodega. Alex is a young activist who strives to fight against her family’s wealthy lifestyle by collecting food for shelters and giving away metro cards undercover. Elvin is a young guy, displaced from his mother, alone and lost In the Harlem Charade, EVERYONE has a secret. This story focuses on three kids in Harlem who team up to solve a mystery AND try to defeat a nefarious politician who’s planning on some very weird gentrification. Jin is Korean American and works after school at her family’s bodega. Alex is a young activist who strives to fight against her family’s wealthy lifestyle by collecting food for shelters and giving away metro cards undercover. Elvin is a young guy, displaced from his mother, alone and lost in Harlem. The unlikely trio band together to help Elvin’s family, solve an art mystery which dates back to the 60s and keep their neighborhood from being destroyed. Part Harriet the Spy part Brown Girl Dreaming, this story will relate to children of all backgrounds, celebrates diverse characters and keeps readers on their toes as the kids dig further into the mystery. Coming of age, activism and amature sleuthing insure that there’s a little something for everyone. Plus the cover is beautiful and engaging, I wish it were illustrated or a graphic novel. It jumped off the shelf into my library bag! A middle-grade mystery set in present day Harlem, New York. This story starts off by introducing three characters in turn, and then brings them together to solve the mystery. Jin is a Korean-American who lives with her grandparents, who run a bodega. Alex is a mysterious do-gooder who leaves metro cards around town for others to find. Elvin is a boy who has recently come to the city to live with his grandfather. There are strange things going on in Harlem. There was a painting found in a garden. A middle-grade mystery set in present day Harlem, New York. This story starts off by introducing three characters in turn, and then brings them together to solve the mystery. Jin is a Korean-American who lives with her grandparents, who run a bodega. Alex is a mysterious do-gooder who leaves metro cards around town for others to find. Elvin is a boy who has recently come to the city to live with his grandfather. There are strange things going on in Harlem. There was a painting found in a garden. Elvin's grandfather was attacked. And everybody Jin talks to gets instantly upset when they hear the local councilman's name. Trying to connect these events leads our team into Harlem's history, into danger, and to discover what truly makes a community. I like how the value of history and community was shown through this story. Well crafted though I wish there were a little more Harlem in the story. Besides the occasional reference to some of the bigger names out of the Harlem Renissance the story really could have taken place in any setting. What would make this book interesting to a kid? Kids love to feel empowered, and this book definitely does that. For various reasons adults are not accessible and the kids have to save Middle grade mystery. The author came to visit our school today and I loved hearing and be able to share her perspectives and writing with my 3rd and 4th graders. She is well-spoken, well educated and writes about her genuine experiences in way that allows my diverse students to all connect with and be inspired by her perspective and the content. She spoke about not seeing herself represented in the books she was reading as a girl and I love that my student are now able to see themselves because of her work and advoc The author came to visit our school today and I loved hearing and be able to share her perspectives and writing with my 3rd and 4th graders. She is well-spoken, well educated and writes about her genuine experiences in way that allows my diverse students to all connect with and be inspired by her perspective and the content. She spoke about not seeing herself represented in the books she was reading as a girl and I love that my student are now able to see themselves because of her work and advocacy. While this book was slow start, it picks up about one-third into the book. The three main characters, Jin, Alex, and Elvin, are strong middle school age characters that are on a mission to find missing artwork, the person that has attacked Elvin's grandfather, and to save their community. Their adventures are very fun to read about, and some of the chapters are cliff hangers. The three are always finding clues to put together, but I wish there had been more so that the reader could more easily f While this book was slow start, it picks up about one-third into the book. The three main characters, Jin, Alex, and Elvin, are strong middle school age characters that are on a mission to find missing artwork, the person that has attacked Elvin's grandfather, and to save their community. Their adventures are very fun to read about, and some of the chapters are cliff hangers. The three are always finding clues to put together, but I wish there had been more so that the reader could more easily follow the clues. I was also dissapointed that Rose did not have a bigger part in the book. I feel as though we were introduced to Rose at the beginning and she is supposedly Jin's best friend. However, then we don't see her much through the rest of the book. Overall, a pretty good middle-grades mystery with a diverse cast of characters. For younger readers not familiar with Harlem's history, this would be a good complementary choice to pair with a unit on Harlem; for some students, this may serve as an introduction to Harlem's history and culture (although be aware: many of the artists and places mentioned are fictional, so consult Tarpley's notes at the end of the story). As an adult, I found the idea of "Harlem World" a little preposterous (an actu Overall, a pretty good middle-grades mystery with a diverse cast of characters. For younger readers not familiar with Harlem's history, this would be a good complementary choice to pair with a unit on Harlem; for some students, this may serve as an introduction to Harlem's history and culture (although be aware: many of the artists and places mentioned are fictional, so consult Tarpley's notes at the end of the story). Such a good book. Art, mystery, history, culture, multicultural friendship and NYC. Lots going in this book but it kept flowing in a great read. I personally LOVE that everything was wrapped up neatly in the end, and while there were several Scooby Doo moments of-You pesky kids have ruined our plans!-it was a good mystery. I love that it was set in Harlem and the end mentioned some of the real places and art. Lydia enjoyed and we are thinking we can get Gloria to read it because of the art. Last y Such a good book. Art, mystery, history, culture, multicultural friendship and NYC.